Good Morning and Welcome to my second What I Ate Wednesday post in a row! I’m quite excited to be back and joining in with all of the fun people who gather at Jenn’s party over at Peas and Crayons. I’m going to dive right in and tell my story as I go. I’m finally back at my own house. After recuperating at my friend Gail’s house for several months ( I started referring to myself as her “squatter” which she found amusing) I am home and it is a bit of adjustment in some ways. Different bed, different kitchen, different arrangement…I have to stop and think where my spices are, where my utensils are, where my crock pots are! No, don’t worry, I never forget where my crock pots are!! Monday afternoon, I suddenly realized that I needed to make beans. Normally I soak them over night and put them in to cook in the morning. But I really wanted them on Tuesday so I tried an experiment. At about 1 in the afternoon, I put them in to soak. My intention was to put them in the c/p at about 11pm. I fell asleep so they ended up going in at 1 am. As I write this, it looks like they’re doing fine, but need some more cooking. But now I know if I forget to soak overnight, I can do it this way. 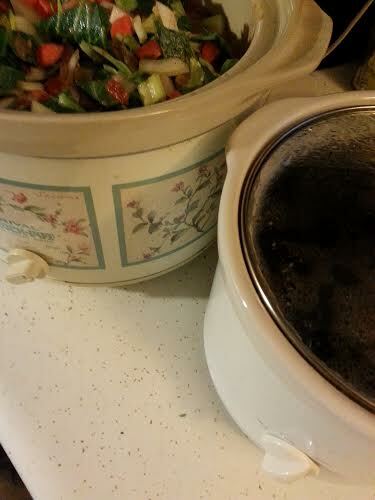 But I think you all know by now, in my house-where there’s one crock pot, there’s probably another. 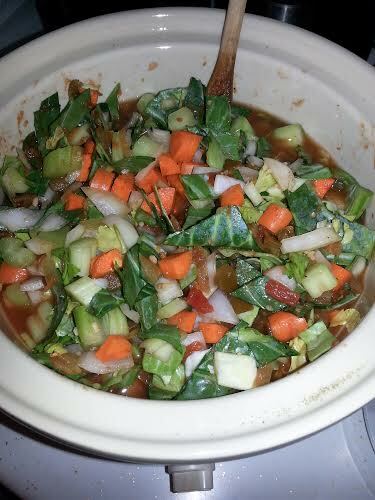 This one filled with my version of the Weight Watchers veggie soup. I’ve missed having this while I was away. There’s actually no reason why I couldn’t have made it at Gail’s house, but as I said…different routine. Funny thing is that it took me longer than usual to make it. I think my chopping skills are a little rusty. I’ll fix that! One of the things I always put in my veggie soup…and my stir-fries, and my morning omelette is Mrs. Dash. I love it because it’s no salt and has so many flavors in one bottle. The mix is always right. 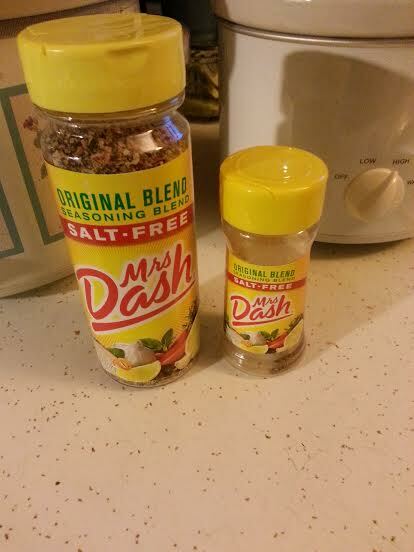 I’m used to the small containers, but Gail found this huge bottle for me, probably on Amazon. I’m so excited because I use it so much. This should last me a week or two! Ralph had to have fasting bloodwork on Monday so I fast along with him. But I tantalized him with Dunkin Donuts after. And I had coupons which saved us almost $6.00!! 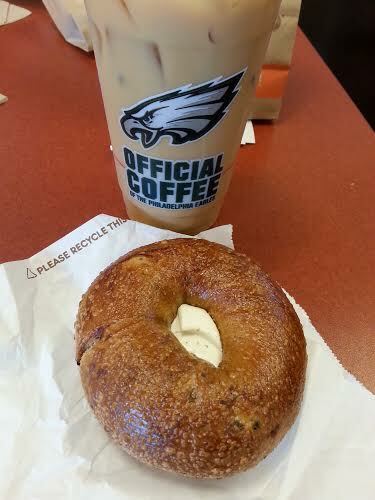 I had iced pumpkin coffee and a cinnamon raisin bagel with cream cheese. It was a splurge, but delicious! I promised you two Birthday cakes, so here goes. My birthday was early in October but because Ralph was away, we didn’t celebrate with my sister, Ele as we usually do. This Sunday we took care of it. There’s a story with this cake, isn’t there always a story in our family?! The candle on top is a gift from our friend, Jim from Washington. He brought it for I think Ele’s birthday and we use it all the time now. The cake itself is very specific and Ele always makes it for me. 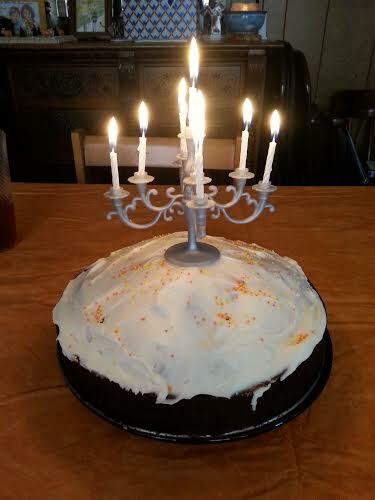 It is a boxed devil’s food cake with lemon confectioner’s sugar icing. It’s what Grandmom always used to make for us and it’s tradition. The next cake is a little fancier! 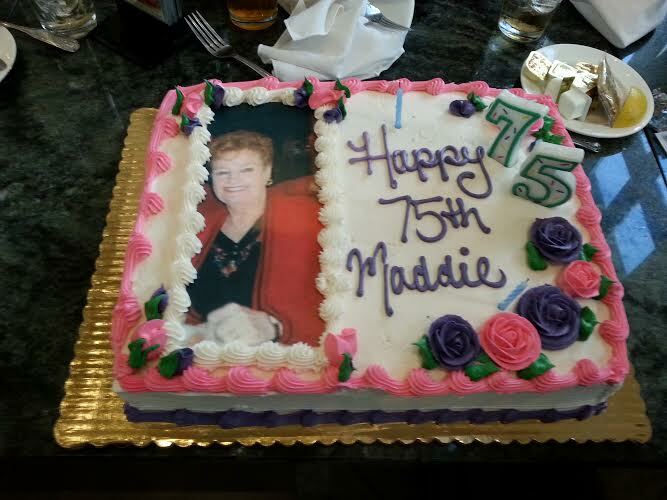 October 13 was my wonderful sister-in-law Maddie’s birthday. Saturday we had a little surprise party for her. The cake was beautiful and we had a wonderful time. As I’m typing this, I’m realizing that I never took a photo of my lunch that day…it was pasta…it was Delicious! That’s my contribution to What I Ate Wednesday today. I’m glad to be back and I suppose it’s just like riding a bike, just get on and type! Be sure to check out all of the delicious food that you’ll find at Peas and Crayons. It’s always a party over there! This entry was posted in Uncategorized and tagged Birthday Month, birthdays, soup, veggies, WIAW. Bookmark the permalink. Glad you’re home; don’t get too used to it (New Mexico is coming:-) ). And I love love love that candelabra!! Thanks, Val. From your lips to God’s ears. I can’t wait to be there…then you can come for a visit!! Hugs!